Forest officials of chirang district sized illegal Sal log worht of Rupees 10 lakhs from Dadgiri debdangi are. 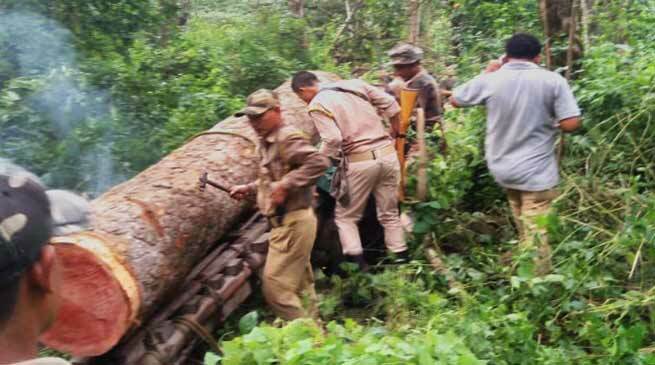 Chirang district forest department on today seized valuable sal logs from Dadgiri debdangi area under Banikanta reserve forest this evening, and burned down the 8 trolling vehicles. The fresh cut sal logs worth over 10 lakhs rupees in market were seized by the forest forest department. Nobody were arrested as the smugglers fled the scene leaving behind the vehicles.